“Gyda, I have come to say goodbye to you properly. I have been thinking about you, about when you were small. You were so lively. You could run as swiftly as the wind. You were like quicksilver. But then, before I knew it, you stopped running here and there and everywhere, and you became still.”_Ragnar Lothbrok, Vikings. We come from the land of ice and snow. Valhalla I am coming! And the Karen O. version too! Rich, full characters and lots and lots of drama and beauty. The show is delightfully fetching—the colors, the shield maiden braids, the eyeliner, the jewelry…Google Lagertha braids and this whole wonderful world of Viking braids and jewelry opens up, just remember to hydrate first! Also, the boats, the weapons, the big warm furs they drape over their beds, their shoulders. The candlelight and fires, the music and opening credits: “If I Had A Heart” by Fever Ray. There is also a lot of blood and water; it is cold cold cold and life is brutal. What I think: Vikings should win sound editing awards and costume awards and writing awards. And as you will see, I get randomly, surprisingly and very adverb-y when I talk about Vikings. Everylittlebit of it is lovely to behold on top of the fact that when I watch, I learn something new about that time period, the people, the countries and kings and religions. Vikings begins at the birth of the Viking Age, 793 AD. 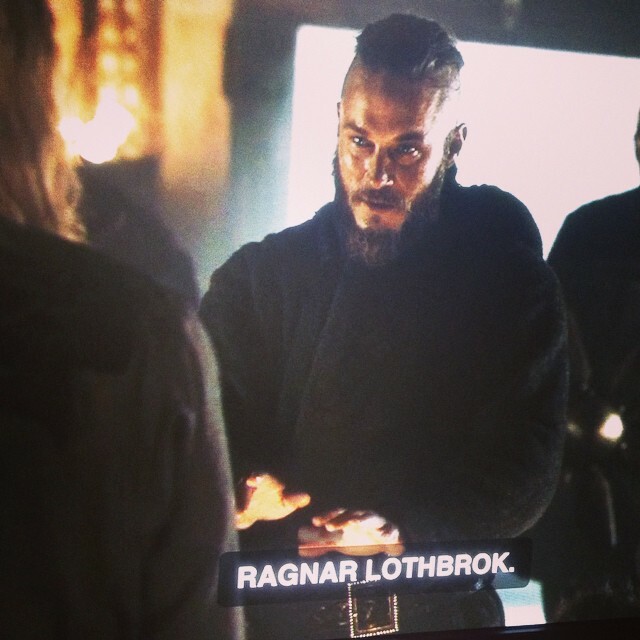 Even the name Ragnar Lothbrok (based on the real Viking man/Norse ruler Ragnar Lodbrok) sounds strong, warrior-ish, like a bucket of rocks spilling out, rolling down. Look up the term blood eagle if you don’t already know what it is. Horrific. When it happens in one episode of the show, it is gorgeous. They make something so horrifying, so beautiful. Ragnar is wearing a white tunic in the scene. They put him in white to perform a ceremonial, ritualistic killing; they put him in white to cover him in sticky-scarlet. I have seen the scene over and over and over because that’s what I do when I love something a lot. I also have the audio and I listen to that too, because that’s what I do when I love something a lot. I love that the women/girls on the show are held in such esteem. I adore both the depth and simplicity of a parent telling a child I love you. I miss you. And no matter where you go, you will always be with me. The women on the show who fight alongside the men are shield maidens. In life, in death, in battle, a lot of Viking women held their own. In this tiny scene with Ragnar, he sets his daughter aside as special. I love how he says Dear child and then her name. Gyda. What I love so much about this scene is he’s alone and not shy about showing his emotions, telling the truth. They say that a man must love his sons more, but a man can be jealous of his sons, and his daughter can always be the light in his life. To actually admit that sure, he should want more sons, revel in his sons, but she was his daughter…and she was the light in his life. I love that. Ragnar has his moment of quiet here, before something else pops up that he must attend to. Viking life is rough and everything keeps going and going. The world doesn’t stop for anyone, but in this scene it feels like it does. And it feels like it should. When we lose someone or need a break, how I wish the world would stop spinning for a second, just so we could catch our breath. I can’t do that. What I can do when things are going going going going: make an effort to pause my brain and take a breath and listen and dreamy-connect to things and feelings and feelings and things. Leesa Cross-Smith is a homemaker and writer from Kentucky. She is the author of Every Kiss a War and Whiskey & Ribbons. She is also the editor of WhiskeyPaper.